Click to open printable, 2-page PDF. Reference Map above of Historic Columbia River Highway and trail closures. Biking the whole distance is not for 99% of people as it involves riding on the shoulder of Interstate-84 with large semis, trucks and RVS. The bike route between these 3 cities is some of the best in America. 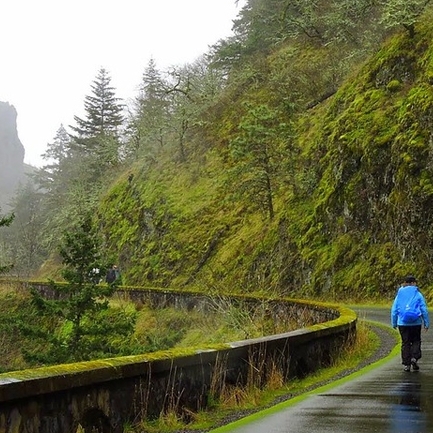 The route is predominantly car-free, paved Historic Columbia River Highway Trail between Hood River and Mosier. Otherwise, you'll be riding on the shoulder on calm, rural Historic Columbia River Highway. Expect jaw dropping scenery. Hood River is very, very hilly. We recommend a super light bike with 8 or more gears or an electric bike (see rentals below). In general, people driving are used to sharing the road with people biking and are courteous. WARNING - bikes are not allowed on the Hood River Bridge to Washington. Free trolley between Hood River's waterfront, downtown and The Heights. Columbia Area Transit (CAT) - Providing a fixed schedule, Tuesday-Thursday, service between Hood River and Portland; and, Monday-Friday service between Hood River, Cascade Locks, The Dalles, Parkdale and Odell. Use Google Maps transit directions for real-time information. 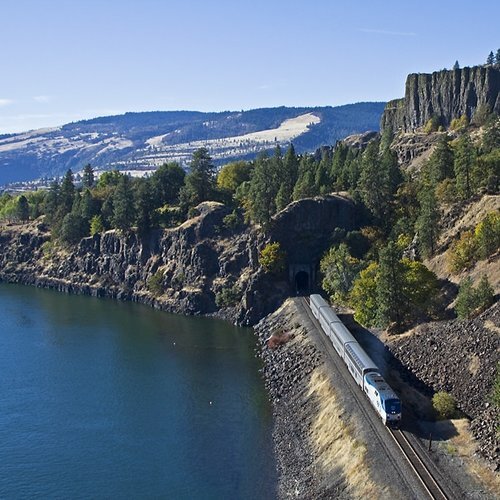 Columbia Gorge Express - Beginning May 25, 2018, Columbia Gorge Expresses daily service will take you from Portland's Gateway Transit Center to Rooster Rock State Park, Multnomah Falls, Cascade Locks and finally Hood River. MountNLoop - a Friday and Saturday shuttle service between participating Hood River hotels and wineries. 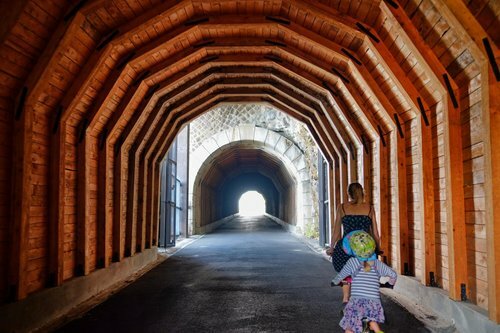 Mount Hood Railroad - more of a tour than transportation, this train will take you from the historic train depot in downtown Hood River to Parkdale, at the base of Mount Hood. 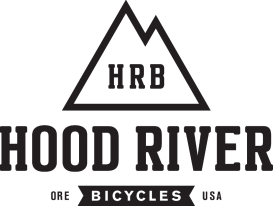 "As Hood River’s premier wine country bike tour, we work hard alongside our partners to offer an exclusive way for our guests to experience the best of what The Gorge has to offer – like a local! We make your safe planning and satisfaction our priority, so all you have to do is show up." Scenic train ride with seasonal themes from historic Hood River depot to Parkdale.
" 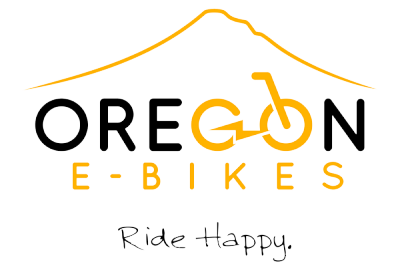 As we begin pedaling East away from Hood River, the propulsion of an eBike instantly creates a satisfying exhilaration, from that point on we are to discover the majestic bounty of the Columbia River Gorge..."
An Airbnb Experience lead by Bikabout.com's founder and ColumbiaGorgeCarfree.com's web designer. This 15 mile electric bike tour includes a bike rental, 1 cider tasting, 1 wine tasting and 1 snack. "The beautiful Hood River Valley is world famous for its apple, pear, and cherry orchards. For the last 30 years, pioneering winemakers also realized that the soils and weather were ideal for growing wine grapes.